What is the great New Zealand building? One answer — or chorus of answers — would be that it is the shed. Thrown up on the landscape like the exact embodiment of the nation’s perceived utilitarian character, ‘this glorious tiny unstable living heap’ — to use a phrase from Murray Edmond’s 1981 poem entitled ‘Shack’ —at once temporary-looking, adaptable, and enduring, has become a kind of bottomless container of local architectural adventure: a form to be revisited, quoted from, argued with, and remade. Rough and ready, it’s a metaphor offering a poetic vernacular to enrich the imported and internationalised language of contemporary architecture. Our contemporary architects pick up their cues from foundation myths: such as the notion of isolation of place (‘distance looks our way’, as Charles Brasch affirmed in his 1948 poem The Islands) and the notion of early settlement’s straightforward, economical shelters – the shed, the shack, the tent – alone against the vastness of sky and landscape. The mythic belief in the shed as an ur-building — a regional design from which other regional designs might spring — gained formal endorsement in the 1940s and 1950s through the activities of the Group, that network of vernacular-influenced architects and students in the post-World War Two years, which was associated with the Auckland University School of Architecture. They became a movement for whom later generations of architects have continued to carry the torch. The Group saw themselves as lifestyle revolutionaries, espousing a relaxed, casual, Kiwi approach. They challenged the old dispensation of British Arts and Crafts-style villas, the more recent California-style brick and tile bungalows, and the Thirties and Forties white stucco houses of suburbia (‘Stucconia’), by promoting buildings that asserted frontier values, and that used simplified shapes and basic materials. Theirs was a purist architecture, crisp, clean, functional; their houses often looked like woolsheds, or small primary school blocks. These were not so much cosy nooks as stark, minimalist houses that encouraged you to be active. They favoured corrugated iron roofs, rough-sawn weatherboard exterior walls, plywood interior walls, and cork or wooden boards for floors. Timber was central: an authentic, indigenous material, warm-toned and intimate, and applied in a straight-forward manner. The ripple of corrugated iron — shiny-painted, or dull, or rusty — across the farming landscape surfaced in the late nineteenth century. By 1905, the minimalism represented by fluted metal draped over wooden frames in overlapping sheets was everywhere. Maori quickly adopted corrugated iron for their whare as cheap and rainproof; and it figured as the roof material of choice for those numerous bachelor huts of colonial times — the functionalist shelters of axemen, fishermen, gum-diggers, shepherds and other workers on the land. The sine wave of corrugated metal — invented to keep thin, whippy sheets of metal rigid — was a rippling nationalist flag. It stood in the collective mind of the Group for useful architecture. There may have been some differences in personal design flourishes, but the Group gang — and their mentors, such as the English-born architect and teacher Vernon Brown — may be said to have sanctioned a localised Pacific style that remains in use today: wide roof overhangs, clear-glass doors that open onto veranda decks, and emphatic indoor/outdoor flow: rangy cross-ventilated buildings that shrugged off rain and welcomed sun. Architecture is a kind of literature. (Think of the fantastic buildings of the Victorians, with their ornamentation, their clutter of detail, that remind you of the era’s more ostentatious novelists and poets, such as Charles Dickens and Robert Browning.) Buildings, after all, are not just about wood and nails and brick, but also about emotion, spirit, memories — they have motifs, they tell stories: they are part of a social narrative. The Group houses, then, suggest mostly a Man Alone architecture — architecture gone bush: woodsy, stark, bare, brawny, masculinist — or perhaps a Frank Sargeson short story: minimal, vernacular, wry, succinct: rus in urbe. Certainly this is the impression you get from the miscellany of essays in Group Architects: Towards a New Zealand Architecture, where assorted architectural historians deconstruct the mythology that surrounds our first home-grown architectural movement by tackling it from a variety of angles, so as to locate it within the Modernist canon of mid-twentieth century New Zealand culture. Gill Matthewson provides a feminist critique in which she suggests that the Group’s idealism was an imposition on women and children. In the early prototype Group houses, women and children were an afterthought. Rational values, the striving for aesthetic control, took precedence over domestic comfort: ‘openness’ did not always create good ventilation, while ‘light’ — the presence of many windows — meant a lack of warmth in winter. 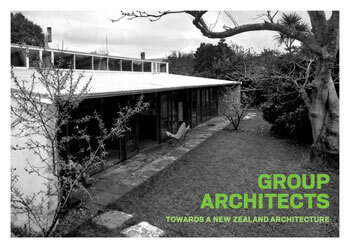 Edited by Julia Gatley, this profusely illustrated book is a follow-up to another anthology volume, also steered to publication by Gatley, entitled, Long Live the Modern: New Zealand’s New Architecture 1904–1984 (reviewed in Landfall 218) — where one of the 180 buildings selected as an exemplar of architectural Modernism is Frank Sargeson’s 1948 bach, now Frank Sargeson House (and thus also a shrine to literary Modernism). The reason the bach makes it into the architectural canon is that it was originally designed by Vernon Brown — with some of his typical features, such as a shed-style mono-pitched roof — and thus is a precursor to the Group’s slightly later buildings. However, in the end it was adapted to incorporate the cheaper building materials that were all Sargeson could afford. As essayists Gatley, Bill McKay and Christine McCarthy make clear in Group Architects: Towards a New Zealand Architecture, the Group architects did not just emerge out of a vacuum. A number of New Zealand-born, overseas-trained architects who had experienced International Modernism first-hand in the 1930s began to bring the ideas of Le Corbusier, Walter Gropius and the Bauhaus back to New Zealand just before World War Two, and thereafter promoted the cause. In particular, Humphrey Hall famously built a coastal house in Timaru, employing Le Corbusier’s ‘shipboard aesthetic’ based on the modern ocean liner: all-white, with a flat roof deck, porthole windows and metal handrails. It still stands, though much modified. And Hall and fellow Modernist architect Paul Pascoe co-authored an essay on ‘The Modern House’ for the second issue of Landfall in 1947. Post-war, the local architectural scene was also enriched by the presence of half-a-dozen Modernist architects who had arrived as refugees from Nazi-occupied Europe — notably Ernst Plischke, who contributed an article to The Group’s one-off 1946 magazine publication Planning 1. Also post-war, amid the gradual break-up of the British Empire, a new mood of nationalism — a fresh wave of anxiety about cultural identity — began to be asserted, typified by Allen Curnow, who wrote in the Arts Year Book, published in 1946: ‘New Zealand doesn’t exist yet … It remains to be created … by writers, musicians, architects, publishers’. The Forties, then, was an era of clarion calls and manifestos up and down the country, and amongst the most strident — tooting like a truck horn — was the manifesto issued by the Architectural Group — a cluster of first-year architectural students at the Auckland School of Architecture — which declared: ‘ . . . overseas solutions will not do. New Zealand must have its own architecture, its own sense of what is beautiful and appropriate to our climate and conditions’. The polemicist who penned this manifesto was Bill Wilson (1919–1968). Six or seven years older than the other first-year students, Wilson had been a teacher at a Maori school in Northland, and as a conscientious objector had served in the New Zealand Ambulance Corps during the War, before deciding to study architecture. Convivial, bibulous and also knowledgeable, he emerged as the de facto leader of the architectural avant-garde movement clustered under the umbrella term ‘the Group’. In fact, it was always a loose association of the like-minded, with Wilson as the one constant. First known as the Architectural Group (1946), by 1949 it had become the Group Construction Company, then through the 1950s as Group Architects, before changing into Wilson and Juriss in the early 1960s — named for the two remaining principals, Wilson and Ivan Juriss. Yet the Group’s ideals were sustained by more than one architectural practice. The Group was founded as a co-operative, and as original founding member Bruce Rotherham later expressed it, the Group from its beginnings could be numbered in the dozens, if not the hundreds — from sympathetic fellow students and teachers, to outside architects, and those who supported the movement. In a way, this was all about the zeitgeist: the cultural turn towards the new, based upon the local. It was also the moment that messianic Modernism made landfall, a utopian moment, when belief in non-profit design for the masses, a concern for the environment, a belief that good design could improve people’s lives, were being agued about and debated — not only at New Zealand universities, but also at pubs and parties: it was a genuinely egalitarian moment. So the Group were part of a bandwagon, and notable fellow travellers included writers A.R.D. Fairburn (who acted as a journalistic propagandist for the Group), R.A.K. Mason, Maurice Duggan, the printer Bob Lowry, and the nationalist historian Keith Sinclair. Others — potters, weavers, school teachers, academics, business people — sought out the Group and commissioned buildings. The Group architects themselves were a slightly amorphous cluster, with some central figures dropping out early on, and others emerging as promoters of the aesthetic, and then of the mythology. An essay by Melbourne writers Justine Clark and Paul Walker investigates how the Group arrived at their pre-eminent status in the history of New Zealand architecture, summarising their findings in prim jargon more or less as follows: The Group brand consisted of a set of alliances which created a unique series of provocations whose collectivism served to subvert the conventions of architectural authorship. In fact, the key players — those closest to Wilson – were dogmatists and proselytisers in the manner of their leader. James Hackshaw, Bill Toomath, and Alan Wild became influential architects and teachers locally, while, later, other tangentially connected architects, from John Scott to Miles Warren, promoted the narrative that ‘the clear sharp minds of that generation of architects saw the house in its simplest terms.’ Later still, the architect and writer David Mitchell built the thesis of his 1984 book and television series The Elegant Shed around the Vernon Brown/Bill Wilson axis of the milking shed-woolshed-whare-farm-hut iconography. Inevitably, not all were enamoured of the Mitchell thesis. The Sydney-based New Zealand-born architectural writer Elizabeth Farrelly’s response to the nationalist rhetoric implicit in The Elegant Shed was: ‘At last, the great New Zealand hovel.’ Other critics have pointed out that essentially the group practised a sub-tropical regionalism, while the Wellington architectural historian Russell Waldron has termed the group ‘totally overrated’, and Vernon Brown ‘a tin god’. In challenging the mythology of the Group, such critics are playing out a cultural battle that continues partly as a North–South divide (Otago architect Ted McCoy, who attended the Auckland School of Architecture during that post-war period, has emphasised his rejection of timber in preference to southern stone), partly as a Wellington versus Auckland rivalry, but above all as a rejection of a particular form of regionalism: the rhetoric of a specifically New Zealand architecture, which was in fact matched around the world by what one American critic at the time referred to as ‘an International Cottage Style’. One might call any disparate gathering of architects, then, a quarrel of architects — a matter of taste-making as much as canon formation. And Gatley alerts us to one of their most memorable legacies — fittingly, given their didacticism: a series of some six kindergartens, all in Auckland and built in the 1950s. Here, in plain modular design, elegant yet unpretentious, low-cost, with exposed roof rafters, and displaying clerestory lighting, open play areas, concrete floors level with the ground outside, and where possible the height of fittings reduced to a child’s scale, we see the best of the Group: form following function, and bringing good design to the masses.